Accory offers three types of stainless steel cable ties, including stainless steel ball-lock ties, ladder type stainless steel ties and releasable type stainless steel ties. They are recommended for applications that have various chemical, salts and acids exposure. The stainless steel ball-lock ties are designed to secure cables, wires, pipes and more in harsh environmental conditions. 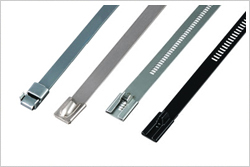 The Ladder type stainless steel cable ties from Qetol have a flat, low profile head for easy application. These Releasable type Stainless Steel Cable Ties have greater flexibility as it can Fasten-Unfasten-Refasten as per usage.